This is a collection of Penn Central-related drawings and clipart items. Feel free to use them for whatever you like. Color drawing of Penn Central F7A 1672 in PC colors, drawn by Nick Rose. 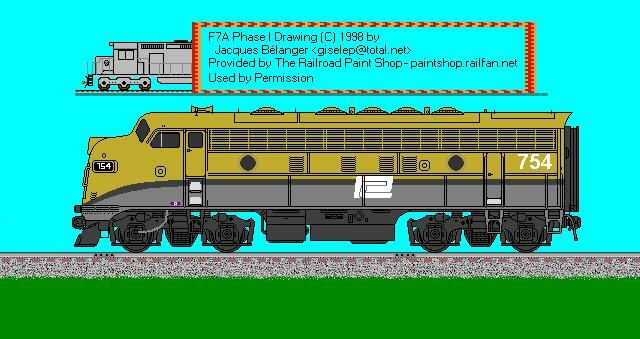 Color drawing of Penn Central F7A 754 in Rio Grande paint, drawn by Nick Rose. 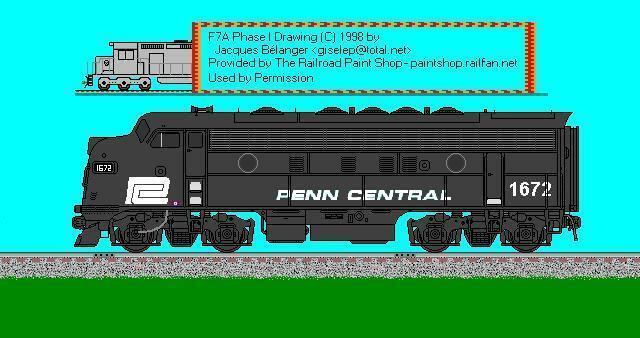 Color drawing of Penn Central F7B 712 in Rio Grande paint, drawn by Nick Rose. Color drawing of a Penn Central FL9 locomotive. Drawn by Stan Lytle. A third color drawing of a Penn Central FL9 locomotive. Artist unknown. Black-and-white line drawing of a Penn Central SW7 locomotive. Color drawing of a PC SW7. Drawn by Jack Bleiberg. PC-U30C_2.GIF: A nicely revised version of the above U30C drawing. Drawn by Jack Bleiberg. Drawing of a PC GP35 in the "red P" paint scheme by Joshua Moldover. Drawing of a PC GP40 in the "orange C" paint scheme by Joshua Moldover. Drawing of a PC C430 by Joshua Moldover. Drawing of a N7 caboose by Paul Lopez. An encapsulated Postscript file of a PC logo. Contributed by John D. Collier. Penn Central "worm" logo with red *quot;P". Artist's rendition of a Penn Central (ex-PRR) hopper. Keystone emblem of the Pennsylvania Railroad.